Always available, friendly, always knew all answers to my questions!! We enjoyed very much and were thrilled that we didn't have to clean the house before unpacking our stuff! Dcor was delightful! We stayed in the condo for 3 nights and had a wonderful time. Everything was great! Also , used the hot tub which was very relaxing with the view of the Lone Mountain! Loved the condo and Big Sky. Plan to return and book this condo if available. Wish we could have stayed longer! My husband, two teenage sons and I stayed at Paradise Valley Retreat mid July of 2018. First and foremost, the view is amazing! Watching the sunrise from the deck in the morning or sitting in the hot tub as the sun was going down, were some of our favorite times during our stay. The beds were very comfortable and the cabin was tastefully decorated. We visited Yellowstone three different days and appreciated the location of the cabin (quiet, away from tourist overload and serene). Our Stay MT host helped us when choosing an outfit for a saddle and paddle (Yellowstone Rafting Co.) and we had a blast! We will definitely recommend Paradise Valley Retreat and plan on returning for a visit with friends in the next couple of years! Very clean, lovely condo in a quiet neighborhood. It was very easy at all points in our transaction and stay, with friendly and timely responses. We had a couple of very minor hiccups when we arrived which were partly due to us overlooking some instructions. But we got a good response from the company Operation Manager and even though we had figured things out, he made sure we knew he was available if we needed further assistance. Excellent. Really helpful, responsive, supportive. Great stay. Everything as advertised. A lot of stairs to get to the apartment but otherwise everything great! Love the location, recommendation, accommodations and customer service exceeded our expectations. 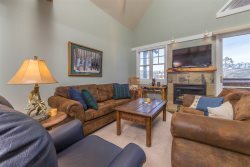 Glacier 160 is a cozy and convenient condo located in the center of activity in Big Sky. Nestled in a quiet neighborhood and surrounded by wooded area and fragrant pine trees, this is a great lodging choice for a personal retreat or family getaway. I enjoyed watching the squirrels play in the trees outside the window, and soaking up some quiet time in the sun on the deck. The condo was very clean and tidy, with all the necessities. Very good wifi. Kitchen appliances are new and upscale models. There was sufficient parking, even on one of the busiest weekends of the year. This lodging gem is a great choice - I will definitely book another stay here. The team was great and helped out any time we had a question along the way. The cabin was beautiful and we really appreciated the special touches like the welcome basket and homemade cookies. This place felt perfect and was a great home away from home. Easy to work with... the cookies and note were a warm and welcoming touch too. It did get a little noisy at night (bar scene and their patrons) and I was thankful we were there for the nightlife and not traveling with our toddler. Excellent, Zach was very helpful in locating a property quickly and showing it. They were very responsive with requests. Wonderful house, great location, fenced in back yard great for dogs, music room, plenty of bathrooms, Beautiful kitchen, beautiful garden and flowering trees. Very comfortable and roomy cabin right on the river. Great location central to everything the Big Sky area has to offer, while being peaceful and secluded. We especially enjoyed grilling out on the back deck while enjoying the river. Kitchen was well stocked with all you need to prepare meals for a family. The 3 bedrooms with 3 baths made it easy for everyone on the go. The split plan allowed for privacy. Basically exactly as advertised. This was a great property that was about 10min from the Big Sky Resort and 1hr from the West Yellowstone entrance. It was nice and big for our group of 8 and was very comfortable. Zach, Sarah and Joe were all very helpful and friendly! Walking into this property was breathtaking. You could tell they have a love for the Montana lifestyle. My family was very happy staying here. Great place with the most comfortable bed we've ever slept in! We would definitely stay here again. Beautiful views from the deck and hot tub, close to Yellowstone and a few towns.